Heidi Melin is an experienced executive with over 20 years of experience in marketing in the technology industry. Ms. Melin is currently the Chief Marketing Officer of Plex Systems, Inc., the leader in cloud ERP for manufacturing. 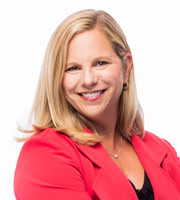 Previously, Ms. Melin was Chief Marketing Officer at Eloqua, a provider of cloud-based marketing automation solutions that form the centerpiece of Oracle's marketing cloud. Prior to Eloqua, Ms. Melin was responsible for the global marketing team at Taleo, a leader in cloud-based talent management and recruiting solutions. She has also served as Senior Vice President and Chief Marketing Officer at Polycom, a global leader in voice and video collaboration solutions; Chief Marketing Officer at Hyperion; and Group Vice President of Marketing at PeopleSoft. Ms. Melin has also served as a public company Board Director for Accelrys (acquired by Daussault Systems in 2014). Ms. Melin holds a Bachelor's degree in political science and organizational psychology from Willamette University.